I feel like all I ever start these updates with is how fast the last month has gone, how I can't believe he is another month older and all the other cliche terms you can think of. This month however, I don't think it's gone as slow as previous months, it feels as though I have been saying 'He's eight months old' for months on end which if it was the case I would be quite content with as I am really enjoying my little bundle so much lately. The end of maternity leave is in sight and it's incredibly bittersweet, I want to return to work to be someone other than 'mum' and provide for my family but I also want to spend an indefinite period with my sons. Nonetheless another month has passed and my boy is nine months old now. Nine months was always a pin point age in my head. When Noah was a baby I read a bloggers story on her little girl passing away at nine months of cot death and I wont lie in saying that it completely haunted me, even still with Patrick I don't think I've been able to shrug off the SIDS worry till now. Don't get me wrong it will always be there, especially as we have had a SIDS loss in the family at seven months old, but the niggles have definitely lessened which is nice. As I mentioned I'm returning to work so I feel like I've noticed every little milestone a bit more this month, because I'm trying to soak up all of these moments I'll miss when I'm back at my job and boy have there been a few. So in Patricks eight month, he crawled, he finally ditched the army drag and got up on his knees at first it was backwards but now he's going full steam ahead which is highly entertaining as it seems to have really pushed he and Noah a lot closer together. Patrick can crawl over to Noahs line of cars and start to play, Noah usually fobs him off with the cars he doesn't like as much but they play side by side and it's the most heart warming scene you can imagine. Sleep has been a huge issue this month, not necessarily all bad as we're in our nice little routine now but it was something that we had to address. The assumption we'd worked it all out in your eight month update was incorrect and a matter of days after said post, you reverted back to waking all night long and wanting to be rocked to sleep. It had to stop. Controlled crying happened and thank goodness it was effective within 24 hours, you're a much more content baby in the day times now and we're all coping better with some extra sleep. We knew my return to work was imminent so we just could not carry on surviving on three hours of very broken sleep, for both of us this was the best thing to do because now I know I won't be risking everyone's lives by driving so deliriously tired to work each morning next month and I know when you attend nursery you wont struggle because you're reliant on your mother to settle you to sleep. Win, win. Teething seems to have totally disappeared this month, I'm not sure what has happened. We thought at one point you had a tooth, but we were wrong it was just a deceptively hard gum, Noah gained his teeth in his eight month and I assumed you would follow suit but given you're organs are still only seven months old, then I'm not too fussed. In regards to eating you are a complete gutter. You will eat everything and anything, and surprisingly given you have no teeth, you are amazing at chomping through finger food - I really wasn't kidding about the hard gum. You become incensed if anyone else is eating and you aren't, you recognise food queues such as being sat in the highchair, hearing the bottle machine, seeing a bowl and spoon, a packet being rustled etc. There really isn't any fooling you, you're just like Daddy when it comes to food. Just last week also saw your first settling in visit at nursery which Mummy was extremely nervous about, I know you're highly strung which is ok for me as I'm your Mummy, but I was a little worried that others might not grow to love you the same given how difficult you can be. But once again, you proved me wrong, you whizzed through the visit like it was a casual thing, smiling, playing with toys and you didn't even cry when you heard another baby cry - which I know is your worst nightmare (he's a bit sensitive is our Patrick). So my little pea pod, we're nine months now. Nine whole months you have been in our lives and what a nine months it has been. As my maternity leave is drawing to a close I can't help but think back to this time last year, feeling so nervous about your impending arrival, wondering what change you would bring to the family dynamic. You're the perfect addition and I can't wait to cherish these last few weeks with you, before I return to work. 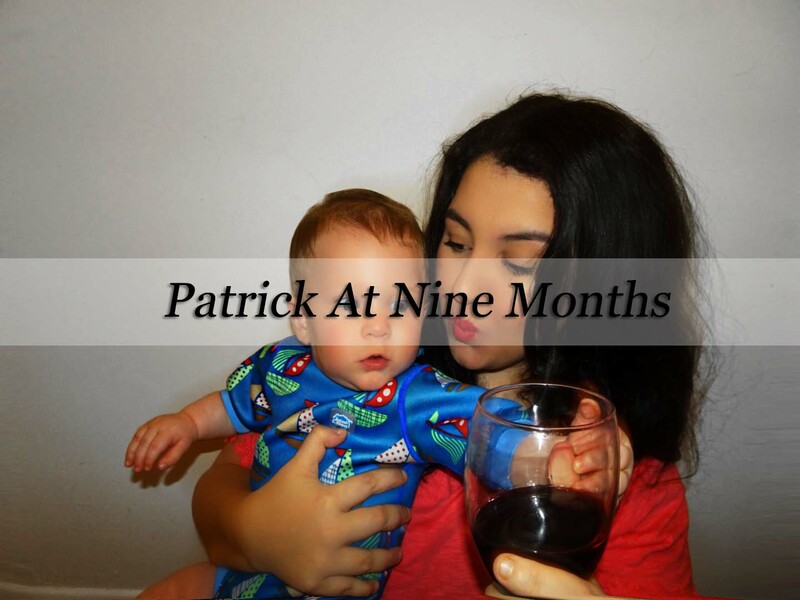 Want to see Patrick at eight months? Haha Erin was like this at that age with food and she's still going! I feel the same way about my monthly updates, it's so hard not to say "wow, another month old already?". I think doing the monthly updates and reflecting on what they have been up to each time is a great way to punctuate time and make you really appreciate the changes. So glad you've got your sleep a little better - it's horrible when all you're getting is broken sleep! How does time fly by so quickly though?! This is such a lovely idea. I managed a photo a month up to 1 year but even that was difficult to find the time! Every month we reflect but I should probably start writing it all down! Such a special time. He might be walking and talking in the next three months. Enjoy. Sending you good sleep vibes for over the next month! Argh I hope you managed to get some sleep! Emelia went through a nightmare phase with sleeping around a similar age, and we came through it - a little frazzled but we got there! And good luck with going back to work! Oh the return from maternity leave is such a daunting one isn't it but you have both taken to it amazingly, Patrick in nursery and you feeling good about returning to work, as you know it wasn't all that easy for me at first haha! I absolutely love that Patrick and Noah play so much together and the picture you added of them is actually so beautiful! I wish for the day I can have this. You're a very lucky, blessed mumma Em, your boys are beautiful and so wonderful!